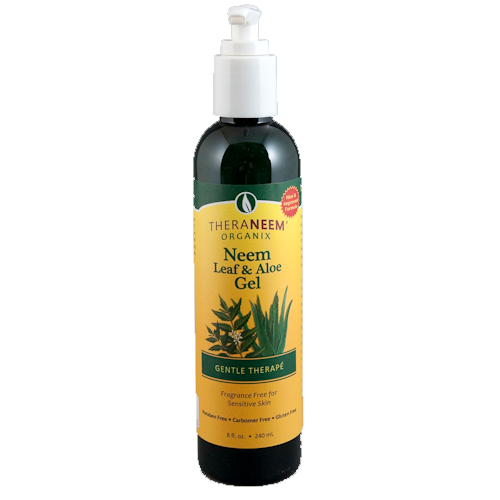 TheraNeem Neem Leaf and Aloe gel - Neem is respected by Ayurvedic practitioners for its ability to support healthy skin. Packed with antioxidants, Neem Leaf calms, nourishes and moisturizes even the most sensitive skin. Certified Organic Neem Leaf Extract and Certified Organic Aloe Gel comprise more than 90% of this cooling formula. Greaseless, fast-absorbing and fragrance free, TheraNeem Organix Neem Leaf & Aloe Gel can be used after sun or shaving. This formula is appropriate for all skin types to help protect & nourish your skin. Apply as often as desired. For external use only. non greasy it makes a perfect hair gel.